Recently, Google announced that it would include mobile-friendliness “as a ranking signal” for web searches conducted on mobile devices starting on April 21, 2015. An analysis of the announcement from Search Engine Watch suggested that responsive websites in general (i.e. websites that resize and sometimes shift content based on your device) might be given priority by Google in future search results across platforms. How do I check if my site is mobile-friendly according to Google? Visit the Google Mobile Friendly Test Page and paste in your website address (e.g. www.opencuny.org/yoursiteurl). This test will quickly analyze your website and show you roughly what your site looks like on a mobile device. 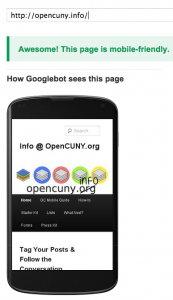 Hopefully, your website, like OpenCUNY.info in the accompanying image, will be judged mobile-friendly by Google. Fear not, if your site isn’t, there are two fixes! How do I make my site mobile-friendly if my site doesn’t pass the Google Mobile Friendly Test? The Quick Fix: On OpenCUNY, we have a plugin called WPtouch Mobile Plugin that will mobile-optimize your site. This plugin has been recently updated and offers a list of customizable features in a separate menu area in your Dashboard to tweak how the mobile version of your site appears. Further, if you already have the WP Jetpack plugin activated, you can turn on a Mobile Theme feature, but there are fewer options for customization than in the dedicated plugin. The Long-Term Fix: Most of the newer website themes today are built to be responsive, so if your site doesn’t pass the test, your theme may be outdated. Activating the above plugin should fix your site, but you may consider switching to a newer, responsive theme. Browse the full list of WordPress-supported responsive themes here, and search this Theme Directory to see the last time that your theme—listed in Appearance>Themes—was updated. If you become enamored with a responsive theme that we don’t currently have on OpenCUNY, send in a Theme Request. As always, if you need any help or further information about the above, be in contact with the OpenCUNY Coordinators, and we’ll be glad to further illuminate this process.